Matt “Handshakin” Holmes is an Intellifluence Influencer as well as an entrepreneur, speaker, author, podcast host and world record holder (more on that in a minute). Matt is the Founder of Handshakin.com where he helps entrepreneurs leverage their personal brand to drive more leads. After convincing billionaires and members of congress to be interviewed in his Handshakin Video Series, Matt often asked why they agreed to meet with him — some just off of a cold LinkedIn message. He learned that his strong personal brand was getting him in front of almost anyone he wanted. You can also learn more about Matt at his personal site and subscribe to the Handshakin’ podcast on iTunes. First off, on your website it says you are a world record holder… Can you elaborate? Yes! My company is called “Handshakin” and back in January 2016 I had been researching – it’s on everyone’s bucket list. Everyone wants to break a world record. I’d wanted to since I was a kid but I never knew where to start. What type of world record should I attempt? After I had my company I figured let me see what type of world records there are related to handshaking. Sure enough I found one that I thought I could beat. It was the world’s longest handshake, which is between two people. So this is two people shaking hands. The previous record was at forty-two and a half hours. That’s a long time. That’s a long weekend you guys. It took a couple months to organize it and it had to be in public. We had to get press and we had to video the entire thing so that’s a big video file. We had several go pros switching off and one iMac that recorded a forty-six hour video file. Impressive that they can do that. At the end of the day we started shaking hands, Myself and my friend, Juan. A friend from the Denver startup scene, which is actually the reason we broke the record was to bring awareness to the Denver startup scene. He had a startup as well as the time. We start Friday at eleven am and we shook until Sunday morning at nine am. The time stopped at forty-six hours and after you deduct breaks, yes you do get breaks. Everyone’s first question is “Matt how did you use the bathroom?” Good news you get breaks so it’s really easy,. You should break the record too. We broke the record by one hour at forty-three and a half hours. As a public speaker, what’s your favorite topic to talk about? I would say my favorite topic is what the audience wants to hear about and my most popular talk is called “How to Use Your Blog to Connect with Influencers”. I simply talk about the basic one-oh-one steps of launching your website and your blog and how to reach out to billionaires and members of congress and really popular entrepreneurs. There’s a couple tools that I included in that talk as well as basic platforms like Weebly. Where you can build a website that a very easy website for a very low cost or for free. You have spent time around many influential people. Are there common traits that you have discovered when it comes to influencing others? Absolutely! The higher and higher of a net worth individual I interviewed the more and more I realized they value relationships over money. Of course, they are strategic about their personal relationships and who they spend time with [and] and who they catching happy hour with. But I could tell the more success they had had the more they valued giving first and seeing someone find value from your relationship. Of course, the more wealthy they are the more they have the ability to provide value to others. But even before they were a self-made billionaire entrepreneur many of the people I interview were billionaire John Paul Dejoria to put it best. He said “you have to start giving today. When you are driving on the highway and you see that car now and help that car that’s broken on the side of the road. You can’t say you’ll do it next time. You have to do it now” and that’s when – wow these guys are really providing value to others right away. Like who knows who’s on the side of the road. It might be someone who can help your business. It might not. They are strategic about that but that’s kinda the mindset a lot of these very successful entrepreneurs hard that I noticed was a consistent theme among the most wealthy ones. As someone who has undoubtedly received many influencer review requests from brands, what has been the strangest one you’ve ever received? Oh gosh, I don’t know. None of them are too incredibility weird with their requests. They all want promotion and they want access to the people who are following your personal brand. Oh let’s see – I had one company who wanted me to do an Instagram post and they wanted to pay me outright. They contacted me on Instagram directly but they did not want me to link to their Instagram page. Related: What is a pitch? Of course, [I thought] why are you paying me? I realized they just wanted to just use the post on my profile as a tool for whatever they were doing with it instead of actually trying to drive traffic to their website or drive followers to their Instagram page. I thought that was kinda strange cause it’s too indirect. If you’re an influencer providing value to a brand the brand should have everything figured out and I’m not sure that brand knew exactly what they were doing yet. So that’s kind of a strange [occasion]. Of the campaigns you have been involved in, what was your favorite review? In other words, what has been your most successful brand partnership? Let’s see… I had a great experience working with a company called Arkon Mount. They sent me a package because I was a speaker at Social Media Day Denver last year in 2017. They have an amazing affiliate program that’s easy. They sent a ton of swag [and] they sent recommendations on what to do with the swag. The founder – I went live on Facebook and I saw the founder comment and just invited him live into my Facebook that very moment. It was a really easy [and] accessible brand to work with. They were flexible too. They didn’t have stringent terms, they just trusted the influencers and sent the influencers lots of great ideas. So I thought the flexibility of working with Arkon Mounts was great and the recommendation that they had so I didn’t have to think about how to promote them. There were a couple options for me to consider but not that I was forced to do. You launched your first Real Estate company after graduating with an MBA and $100,000 of student loans, so you’re well aware of risks involved and steps you need to take to find success Do you have any advice for influencers who are just getting started or are struggling to grow their audience or engagement? Are there any resources you recommend? Yeah there are a lot of resources. I have almost of those on my website, www.handshakin.com/resources. However, I would ask them when they build their personal brand what are the first – what subtitle goes under your name. You really have to know why you’re building your personal brand too. First of all everyone’s good at so many different things but you have to pick five to seven words on what describes you. Which includes leaving a lot of your talents out of you title so get comfortable with that. Come up with something easy and short-term member so people can actually tell their friends about you. That would be one piece of advice. The second piece of advice is why are you building your personal brand. What’s your goal from it. For a lot of the people who I’ve worked with or built their websites they’re startup founders and their building their personal brand because they want more access [and] they want more yeses their meeting requests. In which case I’d say interview the people who you want to interview the people who you want to meet with. Yes, you’re going to get a lot more yeses if you ask to interview someone about their success than if just ask someone to coffee. If you’re building your personal brand to try and improve your networking tactics know that that’s why you’re doing it and ask to interview people. If you’re building your personal brand to try to make a full time living out of being an influencer marketer know how many followers that’s going to entail and how much engagement that’s going to want it. Doesn’t happen overnight. That’s a process that takes a lot longer. So know your why. Where do you see influencer marketing in five years? How will brands be interacting with someone like you? I think it’s going to be much more popular and much more organized. 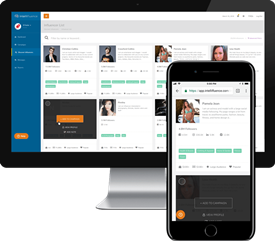 Companies like Intellifluence and many others are helping organize just what influencers can promote what things. That’s making it more helpful to brands and for the influencers we have people who want us to do things for free. We have people who offer us a big budget to do things we can’t do [even] if we wanted to. So there’s a lot of companies helping structure what influencer marketing means and what influencer marketing is. I think it’s exciting and I don’t see it disappearing. In an age where all of us are get more and more notifications on our phones we trust the names that we’ve met in person and influencer marketing is the key to brands accessing that level of trust with consumers.